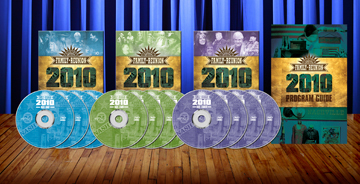 Country’s Family Reunion 2010 was filmed in “2010 “ right here in Nashville Tennessee with over 50 of your favorite artists sharing their laughter, their stories, and all your favorite songs on 12 DVDs! The collection includes all 4 volumes of Day 1, all 4 volumes of Day 2, and all 4 volumes of Day 3. That's 12 DVD's with over 14 hours of country music entertainment! We¹ll even throw in the Program Guide for FREE! ATTENDEES INCLUDE: B. J. Thomas, Charley Pride, Melba Montgomery, Rhonda Vincent, Bill Anderson, Charlie Louvin, Jeannie Seely, Jan Howard, Johnny Lee, Vince Gill, Gary Morris, Riders in the Sky, Jimmy Fortune, Duane Allen, Earl Scruggs, Michael Martin Murphy, Jessie Colter, Barbara Fairchild, Jim Ed Brown, T. Graham Brown, The Whites, Little David Wilkins, George Hamilton IV, Gene Watson, and MANY MORE! The Deluxe package includes the 2 hour dvd series "Country's Family Reunion 2010 Backstage" that captures all the behind the scenes action during the taping. You'll hear rare stories and even snippets of rehearsals not included in the main offer. You get the inside scoop, which is why we call it our "insider's" package.